Frannie Hopkirk is a writer, poet and sister of artist Brett Whiteley. In 1955, a portrait by William Pidgeon of a fresh-faced, 18-year-old ‘Miss Whiteley’ was a finalist in the Archibald Prize. Since then ‘Miss Whiteley’, or Frannie Hopkirk as she is now, has created a life filled with people, art, yoga, children and writing. 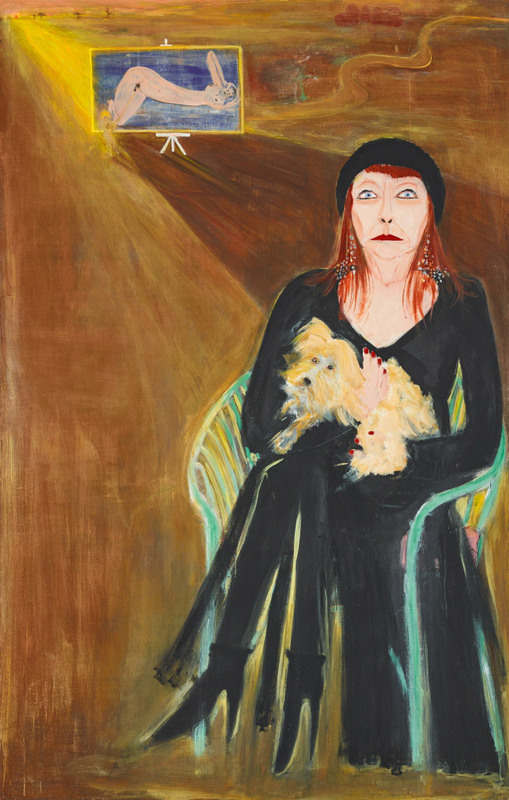 In 1996 she published the insightful biography Brett: a portrait of Brett Whiteley by his sister . Hopkirk is a much-loved and respected presence in Australian cultural circles. This portrait of her, some 60 years after Pidgeon’s, shows Brett Whiteley’s ‘ghost’ in the background, painting one of his quintessential female nudes. It casts a long shadow over the sitter. Born in Launceston in 1952, Pople studied at the University of Tasmania, London’s Slade School of Art and the New York Studio School. He won the 2008 Sulman Prize, the 2009 NSW Parliament Prize and the 2012 Glover Prize. In 2014 his work was the subject of a major solo exhibition at the Australian Centre for Photography. This is Pople’s 11th time in the Archibald Prize.